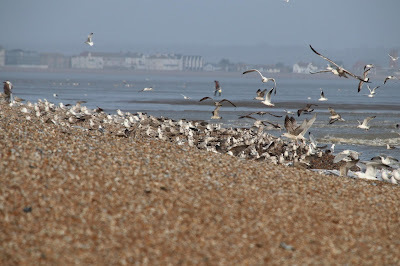 Despite the foggy conditions the sea provided the bird of the day when a very unseasonal Sooty Shearwater flew east along with 676 Brent Geese. 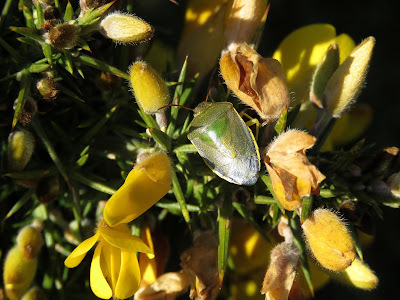 A Firecrest was seen again in the Lighthouse Garden and four Siskins flew over. The spring-like weather continues. 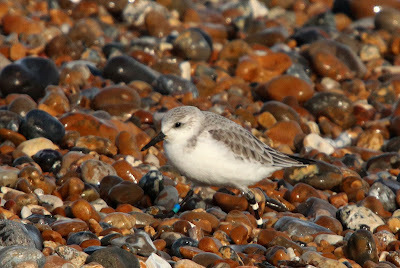 There was barely any movement offshore although nine Sandwich Terns were feeding along the shore. A Merlin was hunting around the fishing boats, six Firecrests were of note in the bushes and the male Black Redstart was around the Lifeboat Station again. A Comma and two Small Tortoiseshells were seen. Another calm, bright and sunny day though not as warm as some of the weather forecasts would have us believe. The obvious highlight of the day was a Hooded Crow which flew in from the west, fed on the beach at the fishing boats for a while before heading north along the coast. It was relocated on the beach at Lade but it then continued to make its way north and was eventually lost from view as it flew towards St.Mary's Bay. 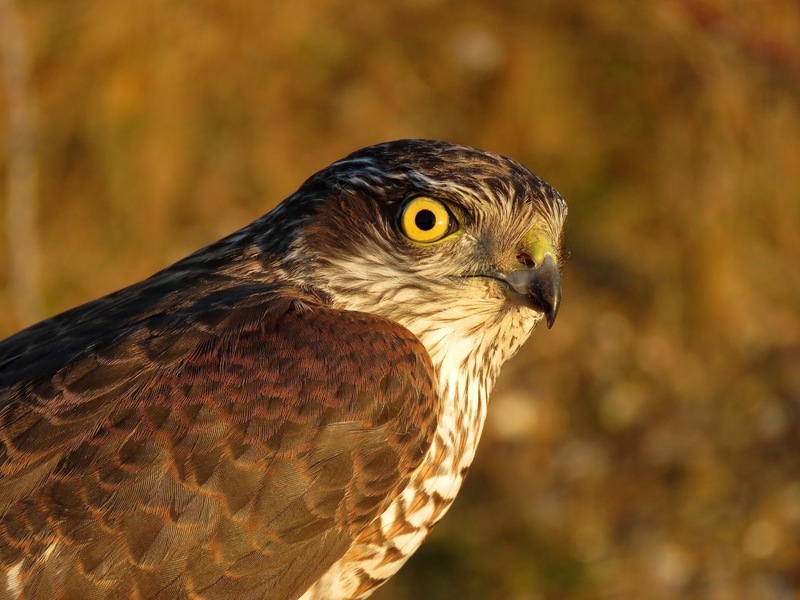 A Buzzard, a Chiffchaff, two Firecrests, 11 Stonechats and a Redpoll were the best of the rest on the land and a Sparrowhawk was caught and ringed. 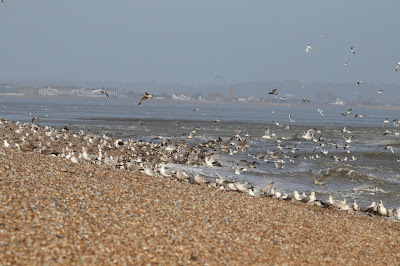 Seawatching was pretty slow although 574 Brent Geese, eight Shovelers and 13 Sandwich Terns were noteworthy. Two Small Tortoiseshells and a Peacock butterfly were seen. A Brown Hare and a Grey Seal were seen. 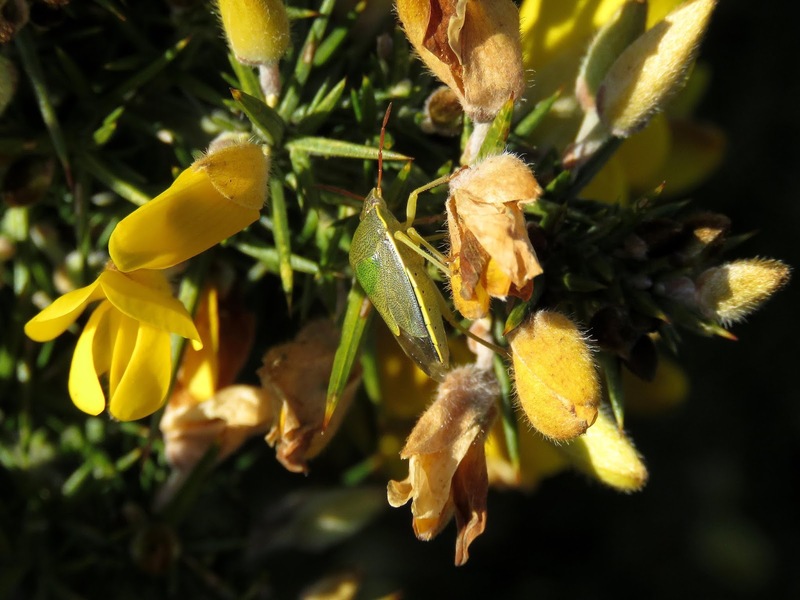 A lovely, sunny day with a light breeze produced a few early migrants on the land including five Firecrests, a Chiffchaff, 60 Chaffinches, three Siskins and 20 Reed Buntings. 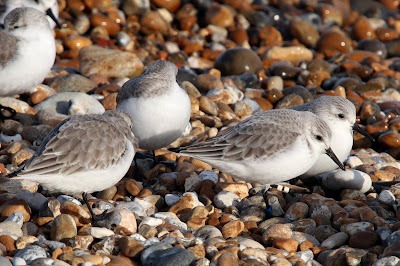 The sea was fairly quiet but 118 Red-throated Divers and nine Sandwich Terns were noteworthy. 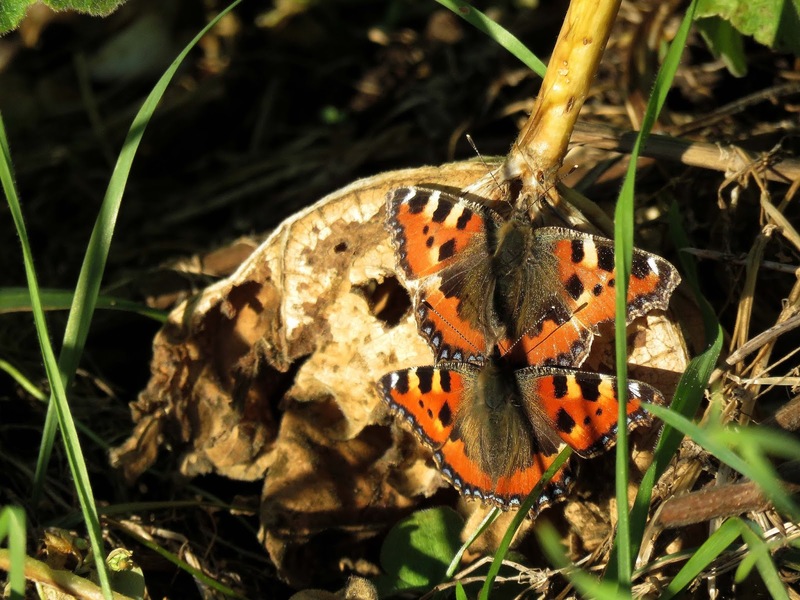 Three Small Tortoiseshell butterflies were seen. A second Dotted Border moth was found in the moth trap this morning and a very early Hummingbird Hawkmoth spent a few minutes feeding at the Winter Honeysuckle in the Observatory garden. 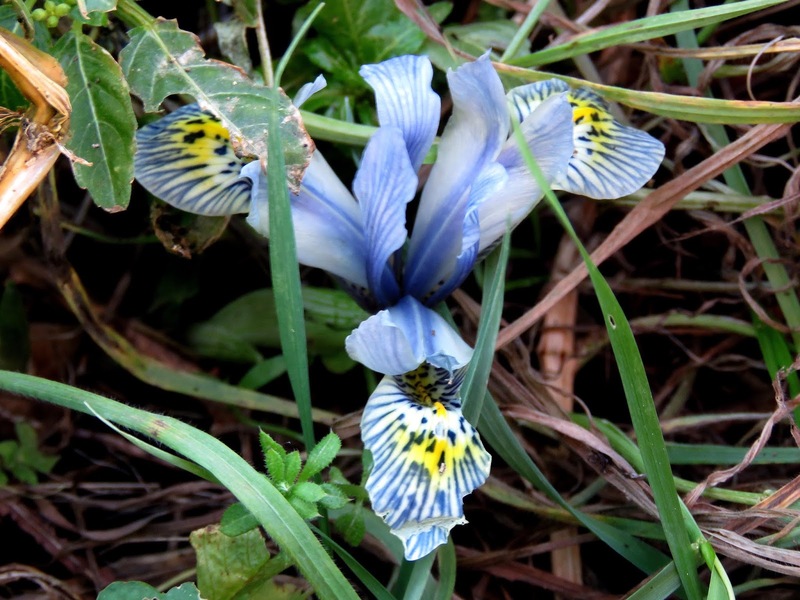 A specimen of the Iris Iris reticularis var Katharine Hodgkin was found growing in the rough ground in front of the Observatory and whilst clearly a garden discard possibly qualifies as a new species for the recording area. A bright and sunny day with a light SSE breeze. 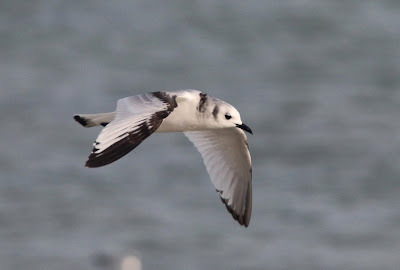 There was a steady trickle of birds east offshore during the day with 33 Wigeon, four Pintail, four Teal, four Red-breasted Mergansers, 357 Gannets, an adult Mediterranean Gull, two Sandwich Terns and a Great Skua. Three Firecrests were seen in the Trapping Area and six Siskins flew over. 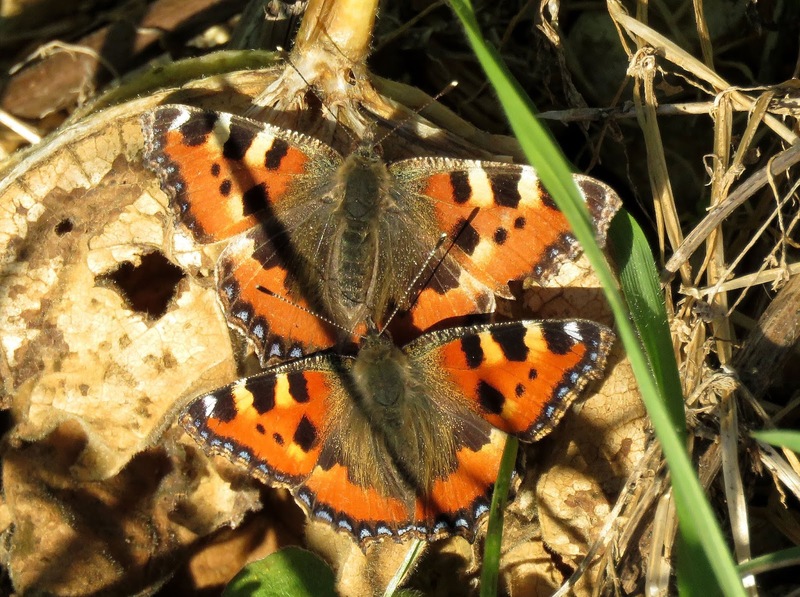 The first Small Tortoiseshell of the year was seen at the front of the Observatory. 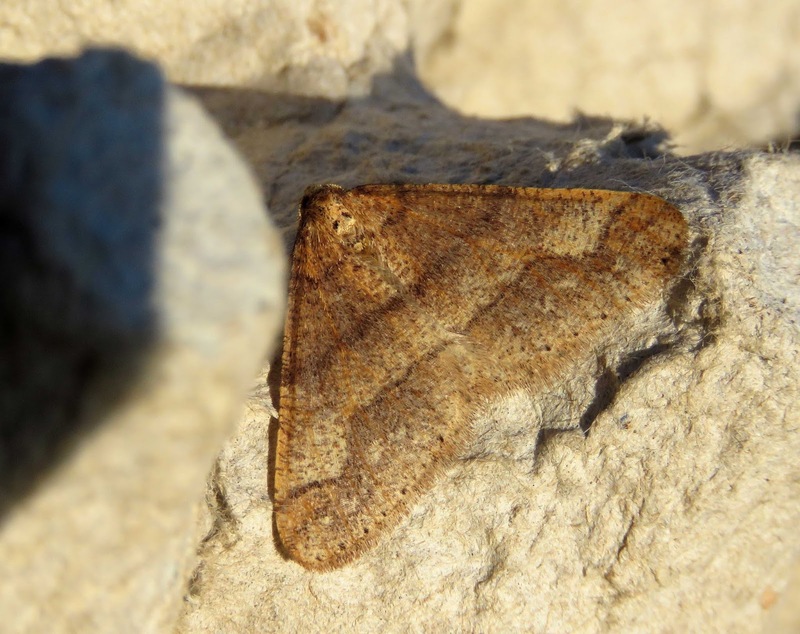 A Dotted Border moth came to one of the Observatory windows. A frustrating day of almost continuous very thick fog with visibility down to a few metres for most of the time. A Jack Snipe was relocated in the wet flashes to the east of the southern Long Pit and a Firecrest was seen in the trapping area again. Not a great deal to report again. One Mediterranean Gull flew east, a Firecrest was seen in the trapping area and the male Black Redstart was feeding near the Lifeboat Station. A fine day but with with very little to report. The Black Redstart was seen around the Lifeboat Station again and five Stonechat and 12 Reed Buntings were found. 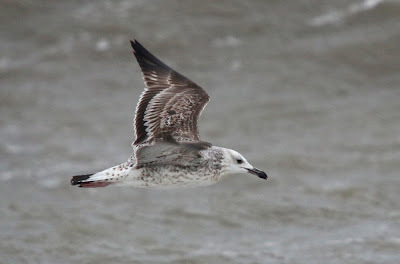 Very little moving offshore with just two Greylag Geese, 13 Wigeon and four Mediterranean Gulls of interest. A Brown Hare was seen in the Desert and a Porpoise was feeding offshore. Very quiet. 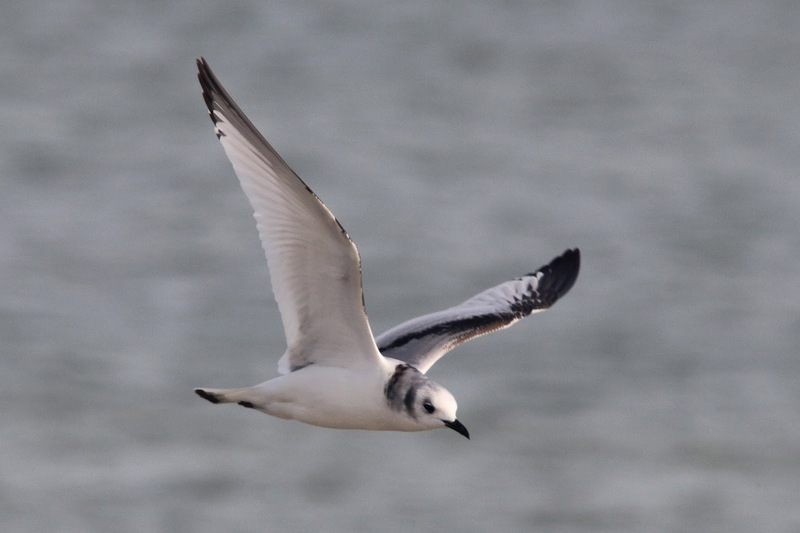 Still a few auks and Gannets feeding offshore but there was very little passage except for the first and early Sandwich Tern of the year. A Kingfisher at the Long Pits was also our first of the year. Not a great deal to report today. 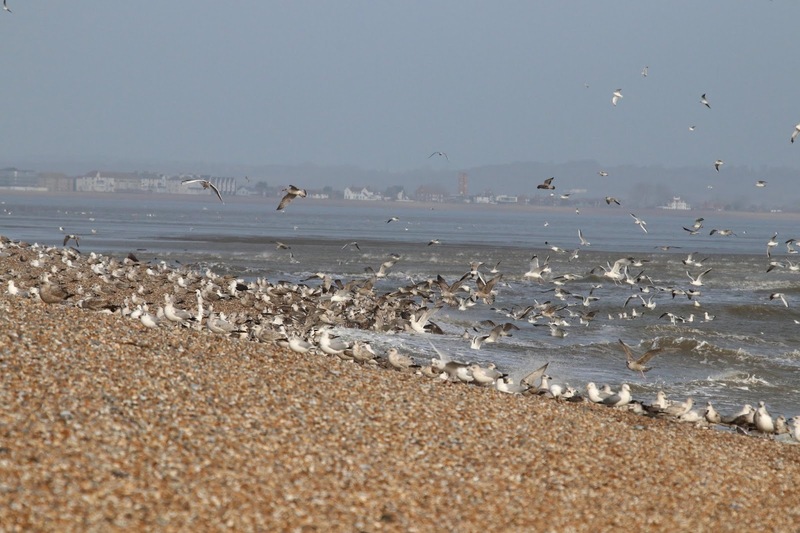 An adult Mediterranean Gull was feeding at the Patch but passage was limited to 200 Brent Geese heading east. 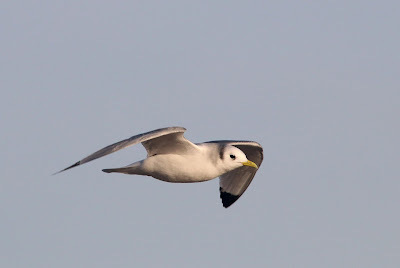 Good numbers of Red-throated Divers, Gannets and auks continue to feed offshore. The male Black Redstart was seen around the Lifeboat Station again. With the fine, spring-like weather there was a steady movement of birds offshore today with 750 Brent Geese, eight Wigeon, 17 Pintail, 324 Red-throated Divers, 870 Gannets, 294 Kittiwakes, three Great Skuas, 435 Razorbills and 2000 auk sp. 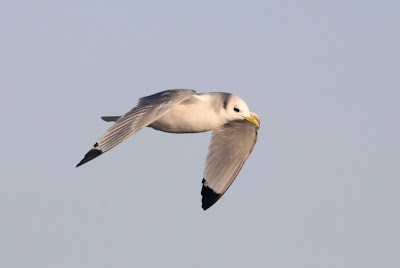 A Glaucous Gull also flew east this morning and was presumably the same individual that was seen later in the morning at St.Margaret's. One Porpoise was also seen. Despite the lovely conditions with a light southerly breeze there was very little to report. 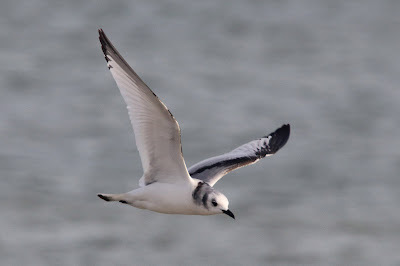 A Great Skua flew west and there were good numbers of Gannets and auks but not much else offshore. A Common Seal and two Porpoises were feeding offshore. 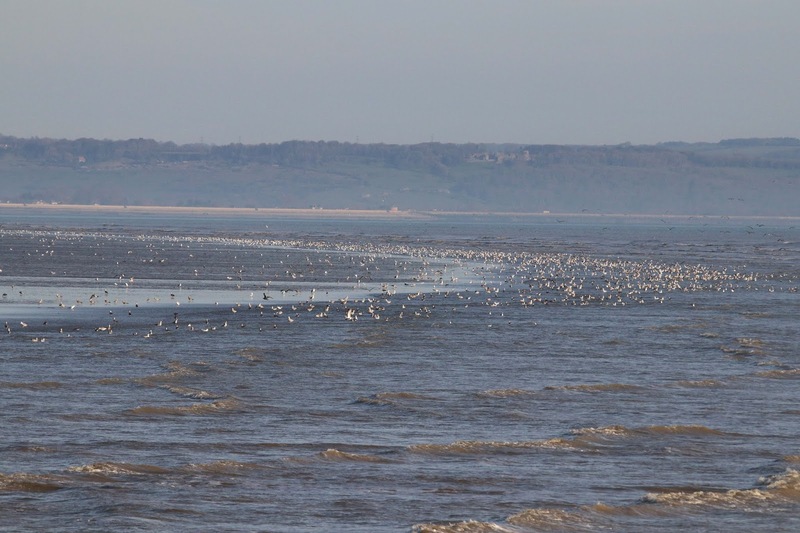 Bright and sunny conditions with a southerly breeze encouraged a bit more up channel movement today with 318 Brent Geese, 22 Wigeon, two Gadwall and 30 Pintail of note. 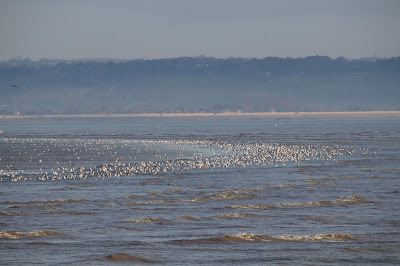 At least 4000 Cormorants and two Mediterranean Gulls were also seen. No sign of any movement on the land but a Firecrest was seen in the Trapping Area and a Black Redstart was seen near the Lifeboat Station. The warm weather of the last few days has encouraged the first Gorse Shieldbugs of the spring to show themselves. Elsewhere, four Cattle Egrets continue to be seen in the small paddocks around Cockles Bridge and two Whooper Swan can still be seen in the fields to the west of Cockles Bridge. A drake Smew remains on Burrowes Pit. A lovely morning allowed a good search of the area with a Jack Snipe, a Woodcock, five Firecrests, a Dartford Warbler, a Black Redstart and three Stonechats of note being found. Little change offshore with lots of Great Crested Grebes and auks feeding but very little in the way of movement. A Jack Snipe was the highlight of several hours watching in the trapping area and where a Woodcock and a Chiffchaff were also noteworthy. 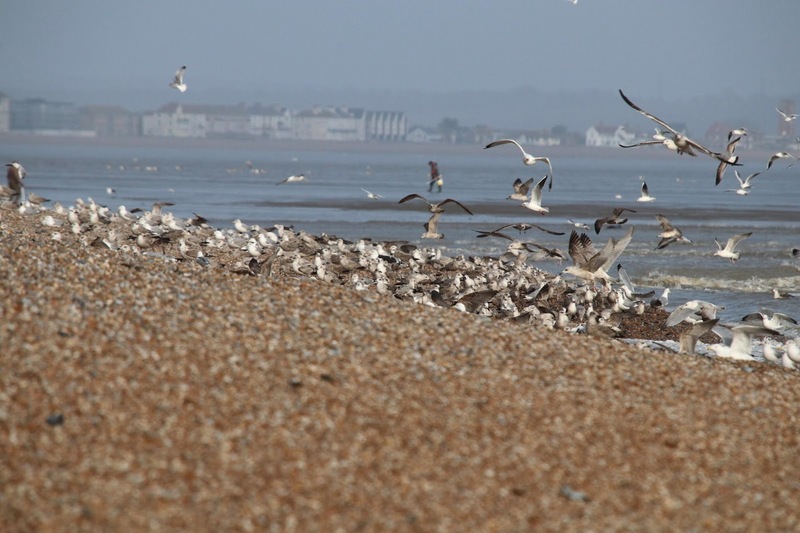 A few Brent Geese, five Shelducks and 360 Red-throated Divers flew east and two Mediterranean Gulls and a first-winter Yellow-legged Gull were seen at the Patch. 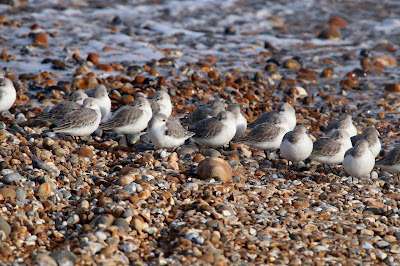 In the afternoon, 28 Sanderlings (including a colour-ringed bird) and 34 Turnstones were roosting on the beach at the fishing boats. A flock of 28 birds was roosting on the beach and included this colour-ringed individual. Hopefully we will have the life-history details in due course. 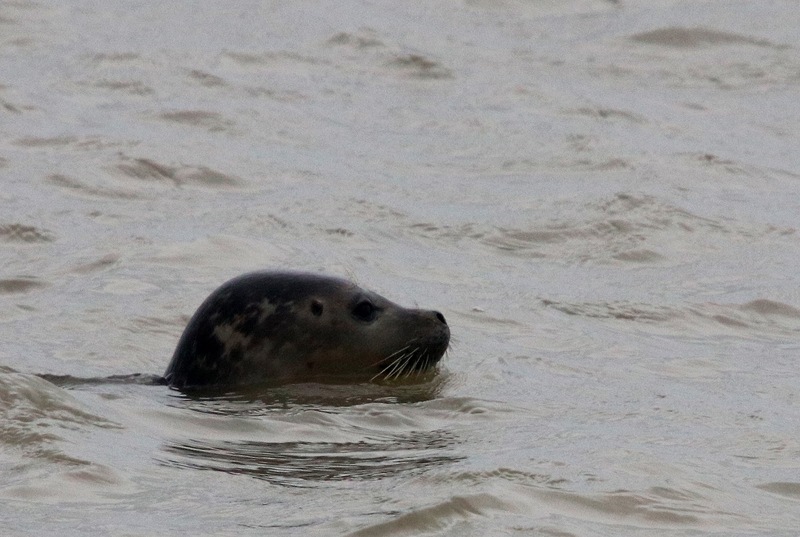 A Common Seal, a Grey Seal and two Porpoises were feeding offshore. Very little change. Quiet in the bushes other than one of the regular Firecrests and 40 Chaffinches. 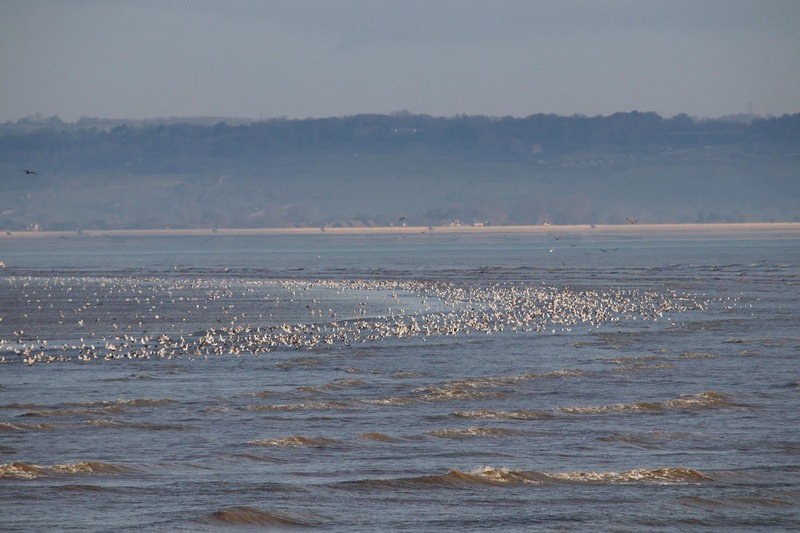 There were at least 1500 Great Crested Grebes feeding off the fishing boats along with an Eider, 300 Red-throated Divers and several thousand Guillemots. One each of both Common and Grey Seal and three Porpoises were also feeding offshore. 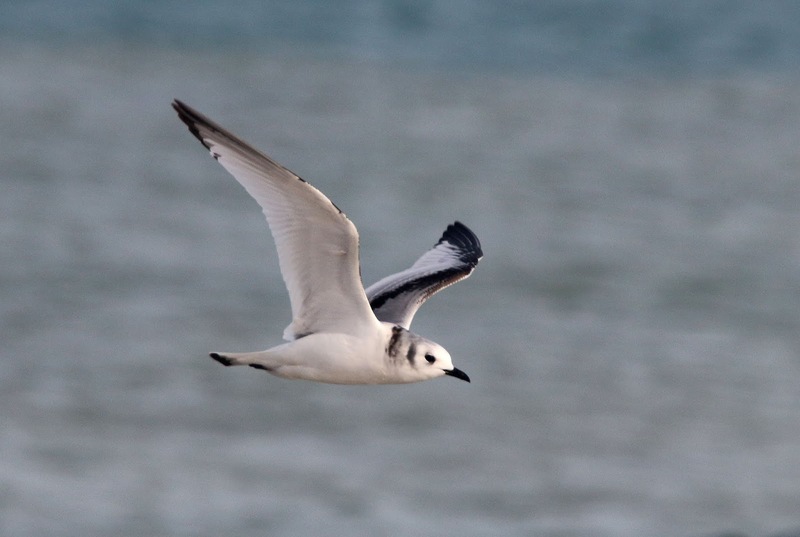 Little change in the weather or the birds with plenty feeding and passing offshore and 200 Red-throated Divers, two Mediterranean Gulls and a first-winter Caspian Gull being about the best on offer. 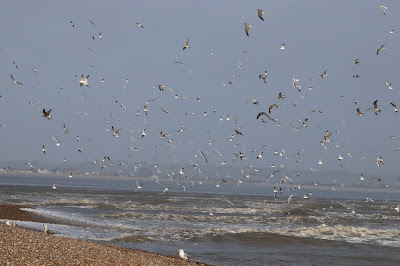 Gulls en masse at the fishing boats. 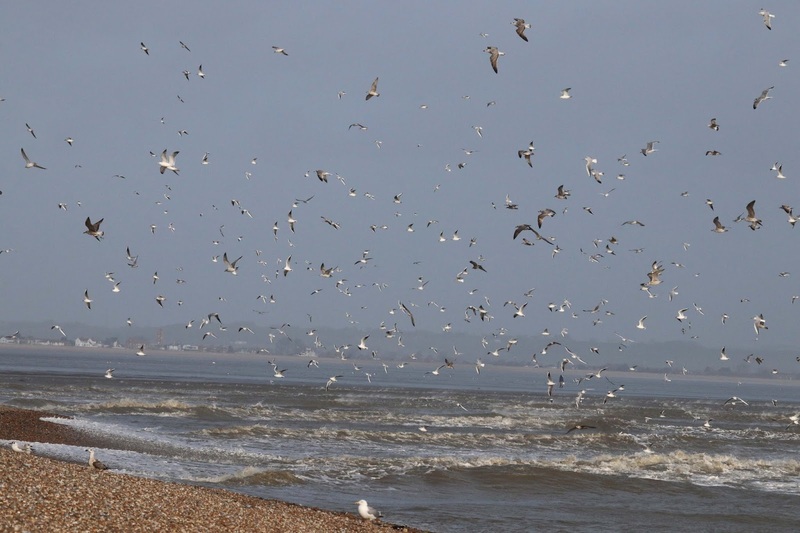 A very stormy day with about 400 Brent Geese moving up-channel and big numbers of gulls including an adult Mediterranean Gull and a first-winter Caspian Gull, a Great Skua and a 1000+ Guillemots. There was no coverage of the bushes. 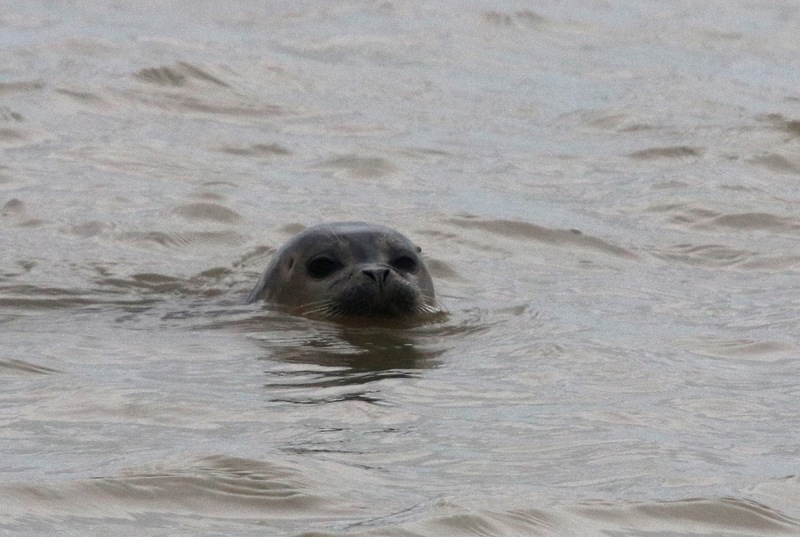 A Common Seal and a Grey Seal were also feeding offshore. Elsewhere, the two Whooper Swans and three Cattle Egrets continue to feed in the fields at Cockles Bridge and a drake Smew can be seen on Burrowes Pit. A very windy day and despite large numbers of commoner gulls feeding offshore there was very little else to report other than a single Great Skua. Two Grey Seals were feeding off the fishing boats. A thoroughly miserable, very foggy day with even the sea invisible for much of the time. 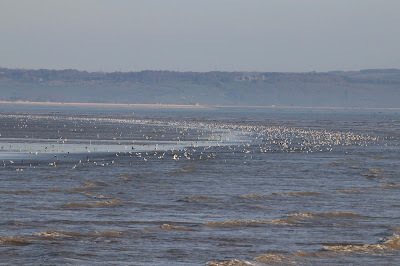 A few Brent Geese flew east in the odd clearer spell but not much else was seen. A Common Seal was feeding offshore again. An adult Mediterranean Gull and first-winter Caspian Gull were among the reduced numbers of gulls feeding at the Patch this morning. The wintry weather overnight failed to produce much in the way of new on the land with just six Redwings of any interest. A Dartford Warbler was tailing a Stonechat around the Fish Hut area and a Firecrest was seen again in the trapping area.